I needed something easy and quick and Bundle Monster (or Konad) is always a great way to get a fun manicure with minimal hassle. 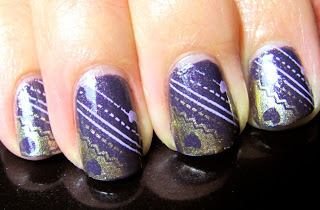 And spicing up stamping is by using multiple colors in the design. 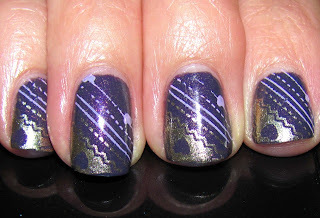 I painted three coats of Zoya Neeka and added Konad Special Stamping Polish in Violet and Orly Luxe. One coat of Seche Vite was used to seal the manicure. I have this stamp and need to try it! So pretty!